Even when students are working with apps and devices, their learning should be social and connected to the world around them. When using digital devices, children often struggle to transfer the skills learned via the devices into their everyday lives. In a recent study, for example, children who used software that showed them how to complete puzzles were unable to complete the puzzles using physical pieces—yet when a human demonstrated the task, the children were able to successfully complete it. How does this research inform my classroom practice with technology? Instead of relying on the tutorials that come with the educational software we use, I demonstrate myself how to use it, and I create my own video tutorials because my students are more likely to take up the skill when they hear my familiar voice and see me demonstrating the features. Over the past decade, research on technology in learning has emerged that informs educators on best implementation strategies when using technology. Below are three practices that teachers can employ so they are using research-informed strategies when selecting tools and integrating those tools into learning. Many schools have moved to a one-to-one device experience, but social learning should not go away just because students have a personal device. It’s important to find digital tools and instructional strategies that allow students to have two-way conversations about what they’re doing and learning. There are several ways teachers can bring social learning into technology integration. Look for applications that allow synchronous collaboration and feedback, such as Collabrify Suite and Scratchwork. Both of these tools support students and teachers in working together on documents, editing, and providing feedback in real time. 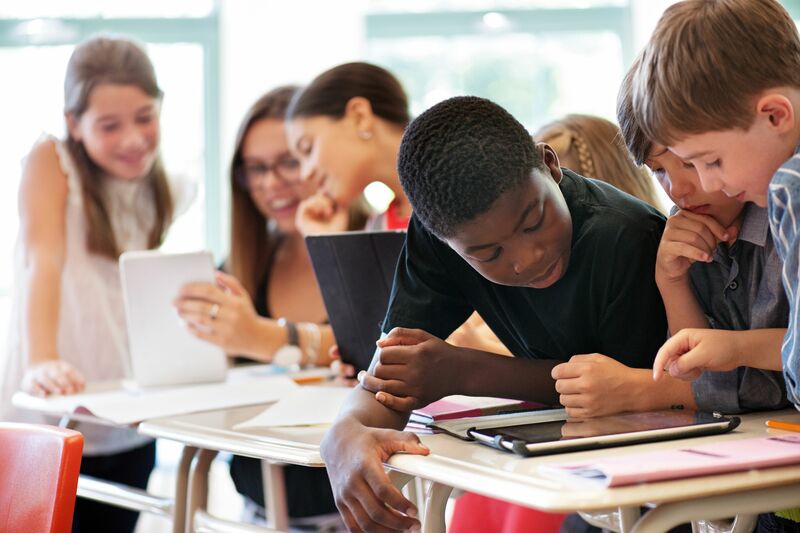 Teachers can also integrate social learning instructional strategies—such as turn and talks, share alouds, think/pair/share, purposefully partnering students, and questioning techniques—into situations when students are working on devices. Lesson example of social learning with technology: Students use Google Docs to write an argument. Have them take full advantage of the synchronicity of Google Docs by editing each other’s work and giving real-time feedback with the comment feature. This allows the students to share in each other’s learning by engaging together in the writing process via technology. Technology is effective when it adds value to the lesson by enhancing the learning in ways that could not easily be done without technology. For example, some tools support differentiation or break down concepts to make them easier to understand. Additionally, software that helps students elicit higher-level thinking tends to be more beneficial to cognitive growth than drill and practice software. Teachers can ensure that technology integration adds value by looking for applications that support students in engaging with higher-level cognitive skills and differentiated learning. For example, in the activity lab of Seesaw, teachers can select or create activities at different learning levels and assign them to individuals or groups of students. Math software such as CueThink helps students to work together on math problems, and focuses on the process of doing math, rather than drill and practice. Teachers can also integrate instructional strategies when using technology that evokes higher-level thinking, such as asking probing questions, using visible thinking routines and graphic organizers, or asking students to do reflective notebooks. This is particularly important if students are using drill and practice software. Lesson example of adding value with technology: Students record themselves reciting poetry with Audacity to work on their fluency skills. The Audacity software adds value to the lesson in multiple ways: It allows the students’ word enunciations to become visible in audio waveforms, it allows students to hear themselves so they can make modifications, and it enables students use their higher-level cognitive skills such as analyzing and comparing. Learning is best when it is situated in real-world experiences. Finding ways that technology can help bridge school learning and students’ everyday lives is useful for making the learning authentic. Teachers can bring real-world learning with technology into the classroom by using applications that allow students to learn with others outside the classroom. iNaturalist, for example, encourages students to explore biological species in their hometown and share their scientific analysis with people across the globe. And mobile scavenger hunt tools such as GooseChase—which allows students to do field-based activities to gather knowledge about their communities—make connections between classroom learning and the world around students. Teachers can also integrate instructional strategies that connect authentic examples with the classroom activity, such as partnering with expert organizations for project-based learning activities, asking students to come up with what they want to learn based on their life experiences, making text-to-self connections, setting up a pen-pal program, or bringing in experts on topics. Lesson example of authentic integration with technology: Students studying environmental impacts on animals participate in a virtual field trip to an aquarium, where they learn about sea turtles and how the environment plays a role in the animals’ lives. The students ask questions of the experts at the aquarium and can see how the turtles react to different elements in their sea environment.